Far Cry 4 Review: Can You Take Me Higher? Things have changed in the Far Cry series. We are no longer on a sunny tropical island. Instead, we’re now being taken to new heights in a fictional country called Kyrat, which resides in the Himalayan region. Let’s find out if this change of scenery breathes new life into the series, or if it suffocates from reaching too high. 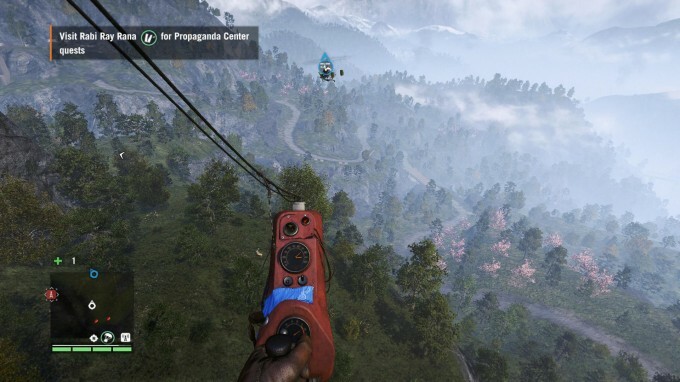 Welcome to Kyrat, the new world of Far Cry 4. It is the home of yaks and tigers and an evil dictator. King Pagan Min rules his country, one of the world’s largest distributors of opiates, with an iron fist. Our protagonist, Ajay, comes to Kyrat to honor his mother’s final wish: to have her ashes spread in her homeland. Upon arriving he finds out that the country is locked in a brutal civil war between the King and the Golden Path. Ajay is quickly thrown into the heart of the conflict by being kidnapped by none other than the King himself. The Golden Path takes advantage of the King’s false sense of security and rescues Ajay from the compound. From this point Ajay will help define the Golden Path’s destiny and help shape the country free from the tyrant king. This may sound like a very simple story but rest assured that this is only one of the many stories that will be told in this game. The most compelling reason to play out the stories is because of the characters. 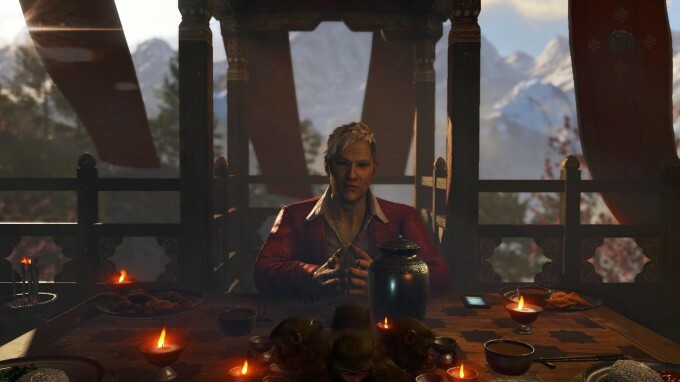 Where in the last game there were only a few memorable characters, this time I felt that every actor and writer excelled in their craft and populated Far Cry 4 with a far stronger cast of characters. In the last Far Cry I had a lot of trouble connecting with the protagonist and genuinely caring about his situation; this time I had no such problems because of the connections between the various characters. Another compelling detail is that the culture in Kyrat feels alive and respectful to similar traditions in that region. Things like the use of mind-altering drugs, the respect for their deities and holding on to the traditions of their past really help make Far Cry 4 feel realistic. This also ties in with the story, as these things are a focal point of contention in the Golden Path’s leadership. The threat of change to past traditions of a society is a source of conflict in the narrative. The side quests and treasure hunting are what will take up the vast majority of your time, but because these rewards are so shallow for the most part, it is hard to be compelled to keep grinding away at these things after you’ve gotten what you wanted. Therefore players will be leaving several dozens of hours of content unfinished. I did enjoy finding some fun and interesting Easter Eggs when hunting for these objects. The co-op is no longer a separate entity; it is incorporated into the main story. Unfortunately it currently disenfranchises players from joining another person’s game. This is because none of the collecting and mission completion will count towards their games progress. The only things that count are levels, money, karma and weapons purchased. This takes away a tremendous amount of time and work to almost not be worth it. The benefit of playing co-op though is that it can help you accomplish many missions with a greater degree of precision and speed. It is however not without its problems. During my play-through with a friend I ran into several de-sync problems along the way. Being the host I could see missions on my map and interact with vehicles and enemies that my partner could not. We later encountered this problem where my friend was the host. There were even times we could not connect to one another because Uplay would not give me the option to invite my friend. However, the biggest bug I ran into happened after I fired up the game the following day, where I had lost several hours of gameplay while playing solo. The exact reason for this occurrence could not be determined. Even with the inclusion of co-op, this game feels almost no different than Far Cry 3 in its storytelling and gameplay. There is the same radio tower system, outpost liberation missions, I mentioned rewards before that is similar, habitual drug use, side missions and on and on it feels a lot like the same old Far Cry game we’ve seen before. 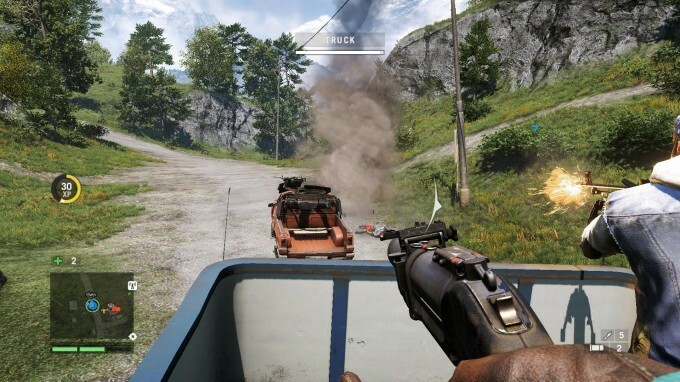 Like the last game the player is given drugs, voluntarily or not, to relive a journey to Shangri-La much like the protagonist did to relive past choices in Far Cry 3. This game just feels very familiar to the games that came before. I do believe the story with its new setting brings with it its own flair and fun but if you weren’t impressed with the previous game, this one probably won’t impress either. There were several minor bugs that could be found but none of them proved to be a hazard to gameplay. The majority of them were linked to the AI’s behavior where they could sometimes see fallen enemies through walls, enemies driving by would not detect me. I just hope Ubisoft fixes these and quickly. The smallest consistent issue that bugged me the most was the one where I could see a mission popup on my mini map to earn extra karma but when I would head towards it, it just disappeared. This didn’t happen on a regular basis but it was frustrating with each occurrence. An improvement that has finally come to Far Cry is that you can now hide in bushes and not be spotted if you are in full cover. I have been complaining about this since the first Far Cry game and I’m happy to see it finally be implemented. If you are someone that likes to skip cut scenes or intro videos I have to warn you that there is no option to skip or pause them. I found myself having to rewatch a couple of videos and being frustrated at this fact. The graphics are certainly the second best asset in this game. If your rig can handle it and you have an NVIDIA video card, then I recommend you max this game out. I was consistently impressed with the lighting effects in particular; the “god rays” and the HBAO+ with soft shadows enabled were particularly impressive. There were some issues with shadows disappearing in certain parts of the map and then coming right back; these were not a consistent problem however. Where the engine struggles graphically is the draw distance. The game lets you operate a gyro copter, hang glider and wing suit and at these times you will see a lot of pop-ins and notice the shadow draw distance creep along with you. I for one do not think that this is a problem because when you get down to ground level these problems are almost nonexistent. The music is certainly interesting but my biggest problem with it is you cannot change the station. This makes sense from a story point of view but when you are treasure hunting and walking across the grassland, it would have been nice to choose from a variety of music to provide some additional entertainment and not only be able to listen to it in the car. In the end, Far Cry 4 brings with it a better story, characters and graphics than the last game. I have enjoyed the time that I have played but the flaws are an obvious ailment that can be cured if it goes through a little bit more rehab and gets patched up. For now, my best suggestion is to let Far Cry 4 cook a little bit longer before partaking in this drug-induced experience. Busy work to fill most of the players time.